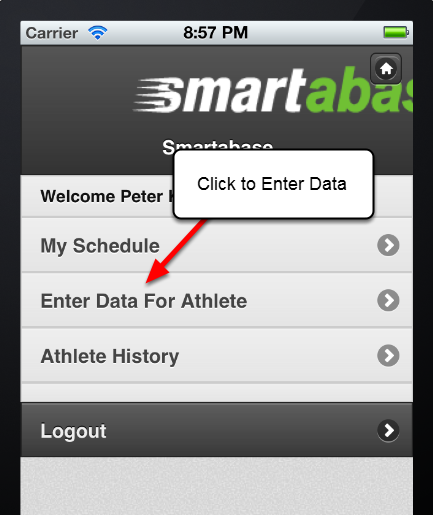 You can enter in new data on the iPhone and iPad using the Enter Data button. N.B. You cannot currently change groups on the iPad or iPhone software. The software automatically loads the group of players that you were last viewing when you were on the internet browser or installed version of the software. 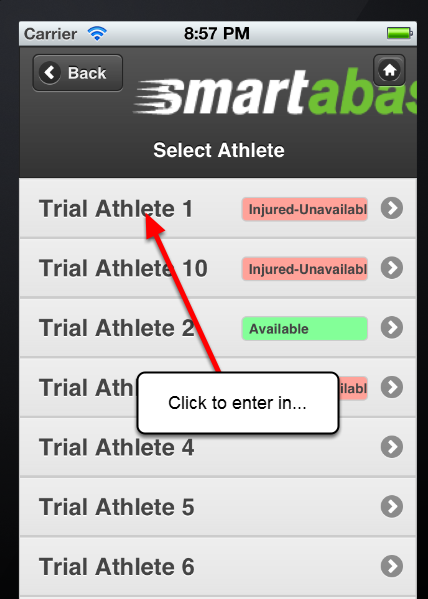 If you have a specific group that you need to access that includes athletes across multiple groups, then consider how you could set this up and talk to your system Administrator. N.B. If you have more than 25 athletes in the group that you are accessing, the athletes will be condensed into last name groupings. This prevents a lot of scrolling. The image here shows that this group has 109 athlete. Rather than having to scroll down the list of 109 athletes to select the athlete to enter in new data for, the athletes are grouped by last name. You click on the last name group and then select the athlete for the subsequent group. This list of Events will be different from your list on the main application. Events have to be manually set up by your system Builder to enable you to access them on the iPad and iPhone software. Some forms are NOT compatible with the current software. We are working to ensure all form types are compatible and this will hopefully be available with the next version of the software. N.B. If you have Event Forms list twice at the top of the page and then again in the list of Event Forms, this will be any Event Forms that are set up as Favourites on your main system. 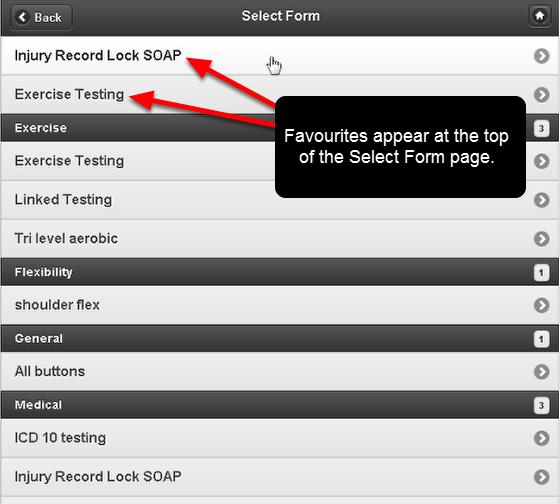 On your main application some specific Medical or Fitness Testing Event Forms may have been set up as a Favourites (these should be the forms you use most often) to help speed up data entry and access. These will appear at the top of the Select Form list to minimise scrolling on the iPad/iPhone enabling you to enter in your most commonly used Event Forms faster. The iPad and iPhone applications split the form up into Sections and ONLY display one Section at a time. The first Section displays the date and time fields that the record is stored. Select the correct Date using the forward and back arrows. 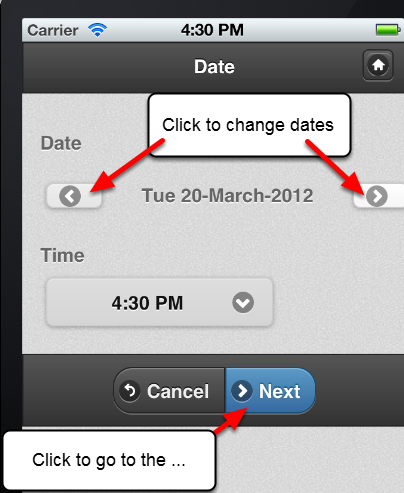 Select the Time of the entry by clicking on the time drop down field and selecting a time. Click Next to go to the next section. Click Cancel to cancel out of the new entry. N.B. 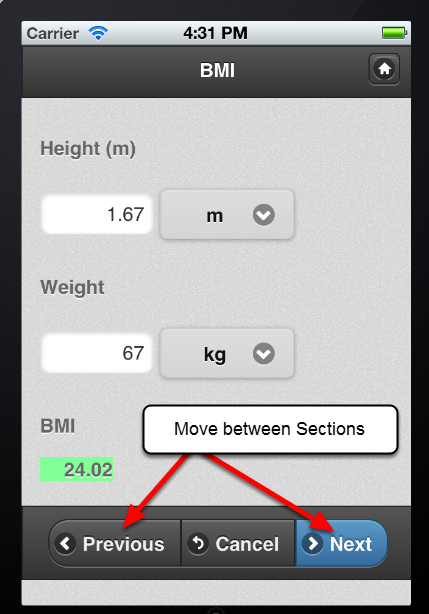 Sections can be set to appear as separate sections or they can be grouped depending on how they are set up. Enter the data into the Fields. 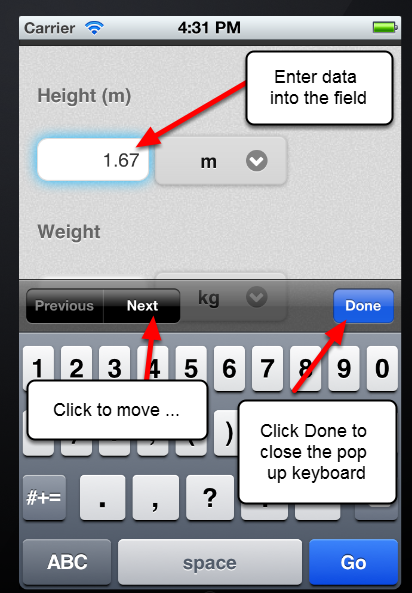 You can use the "Next" button to move between fields. 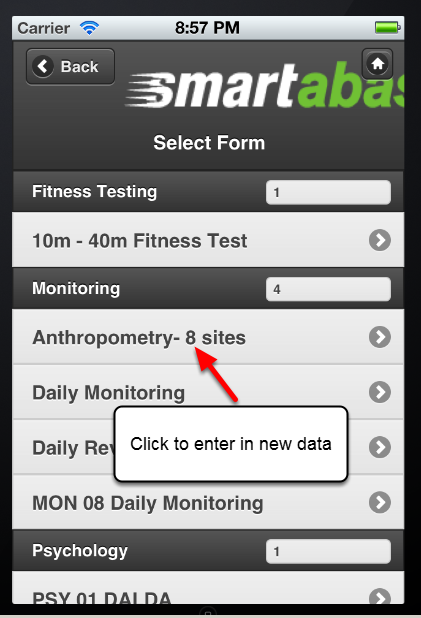 Or, you can manually click on the field and enter in the data. Once you complete all of the fields in a Section, click "Next" to move to the next Section's fields. You can click on "Previous" to go back to the previous Section. Use the Next button to move through all of the sections of the Event Form. When you have finished entering in data, click on "Save" to Save and Close the Record. 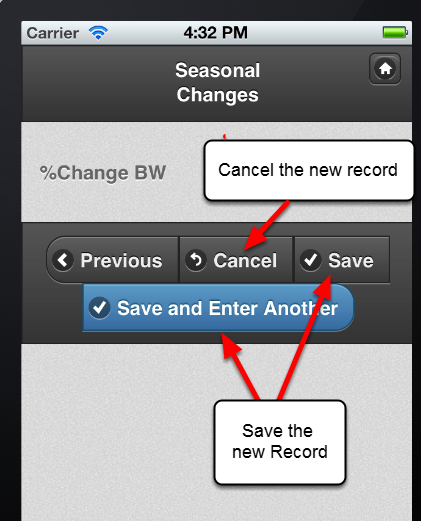 Click on "Save and Enter Another" to save the new record and choose another type of Event Form to enter. You can Cancel the record if you do not want to save it. N.B. If you are entering in a new entry that has Related Events set up to access with the entry, please read the lesson on Related Events to learn how to enter them in correctly. If you need to return to the Home Page, click the Home Page icon at any time.